Welcome to the web site for the town of Ashley, Indiana. This site contains information about our government, town utilities, emergency services & economic development. We invite you to check out or new web site and contact us to let us know your thoughts or if you have any questions. 40 miles North of Fort Wayne, Indiana. The Northern 1/3 of the town is located in Steuben County and the Southern 2/3 is located in Dekalb County. The center line of Indiana State Road 4 (State Street) is the County Line. bordered on the East by I-69. AMENITIES: Ashley is home to four parks. Ashley Memorial Park consumes an entire block within the center of town where the smiley face water tower is located. Sunset Park is a 12 acre park located in the southwest corner of town. The park has two baseball diamonds, tennis court, three basketball courts, three pavilions, three shelter houses, a pond, and a half mile walking trail. John Carpenter Field is a ball diamond located on the north part of town. The main community event is the Ashley-Hudson Festival, which is held annually on the first Saturday of August. This event is facilitated by the Chamber and includes day long events in both communities. The Ashley Community Center houses the Ashley Gym & Fitness Center and has exercise, cardio and weight equipment and training programs available. EDUCATION: The entire town is serviced by the DeKalb Central School District. Country Meadows Elementary is located 1.75 miles south of Ashley. The older students attend DeKalb Middle School and DeKalb High School. EMERGENCY SERVICES: The Ashley Police Department is located in the Ashley Community Center and consists of three full time certified officers and three reserve officers. The Fire Department consists of 22 personnel that are all volunteers. The Fire Department also operates an emergency response team consisting of certified emergency medical technicians, first responders, certified “Jaws of Life” technicians, and hazmat technicians. GOVERNMENT: A three-member town council, elected every four years, meets on the second Monday of every month. All meetings are held at the Ashley Community Center. HISTORIC: The Town of Ashley was platted and incorporated on July 18, 1892 by the Wabash Railroad. It was named after Ossian W. Ashley, the president of the Wabash Railroad. In the early years the town housed many railroad yards. The Indiana Improvement Company bought land and established the division of the Wabash Railroad that runs along the northern boundary of DeKalb County. The new railroad and the technology that accompanied it drew a large influx of people to the area. 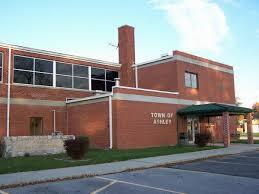 UTILITIES: The Town of Ashley provides water and sewer services for residential, commercial, and industrial customers. Electric utilities are provided by Northern Indiana Public Service Company (NIPSCO). Ashley is where the “Smiley Face” water tower is located and has become to be known as the town of the “Smiley Face”. The wastewater plant was rebuilt in 2006 and has a capacity of 400,000 gallon per day. All of the utilities have generator back-up power sources.